One of a handful of American films that attempts to present all sides of the Vietnam War as fully developed characters rather than the usual practice of showing the Vietcong as just shadowy presences hidden in the jungle. Political arguments are also largely ignored since this is a war between people who kill each other, take each other prisoner and sometimes find it hard to continue the killing. 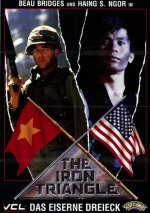 Narrator Beau Bridges plays an American captain who loathes the cruelty of his allies, the South Vietnamese, and is then taken prisoner; the Oscar winner from The Killing Fields, Haing S Ngor, plays a North Vietnamese officer and French pop idol Johnny Hallyday plays a cynical, psychopathic French soldier who's stayed on since Dien Bien Phu.